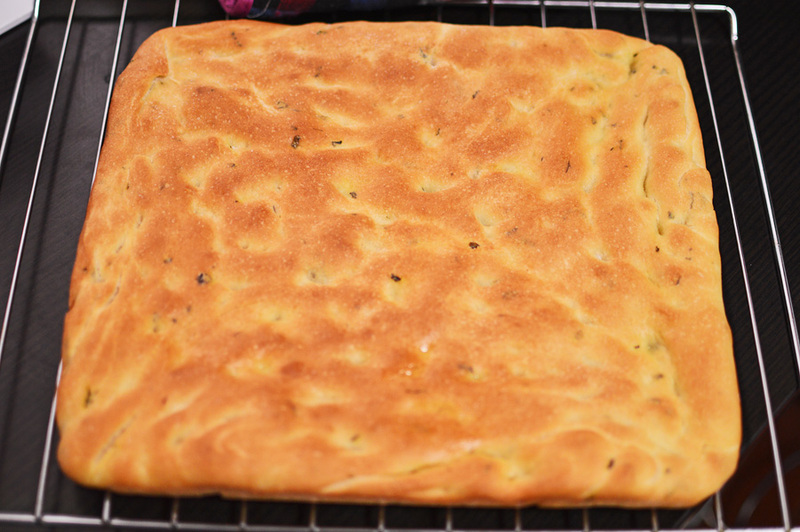 Focaccia sounds like an enigmatic lover. It’s the kind of romantic name that would roll off my tongue after going easy on the wine, when in the throws of passion I’d utter in a husky femme fatale voice and say ‘oh focaccia my love, I have killed Valentino to be with you forever’ or something idiotic like that.. except Focaccia isn’t some chivalrous lover, it’s a chivalrous carb form, a wondrous bread if you must. A sort of flattened bread, slicked with olive oil and a treat to end all treats. 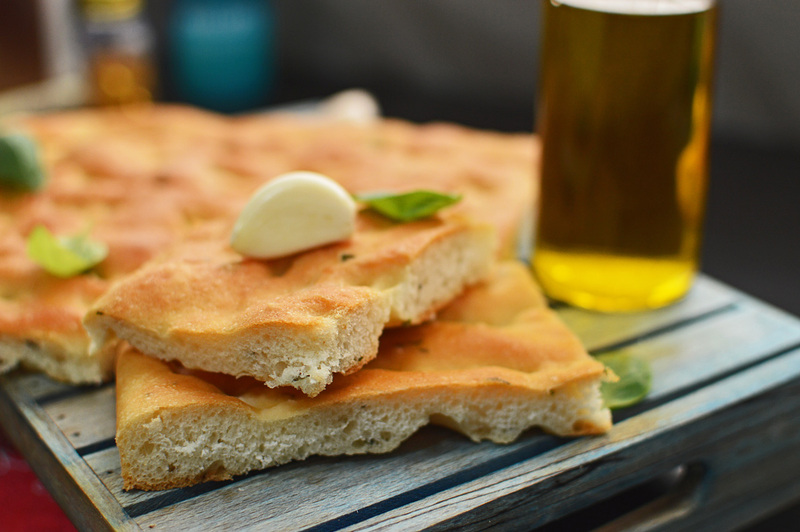 Much like focaccia the lover, you’d want to take this bread back to bed with you. 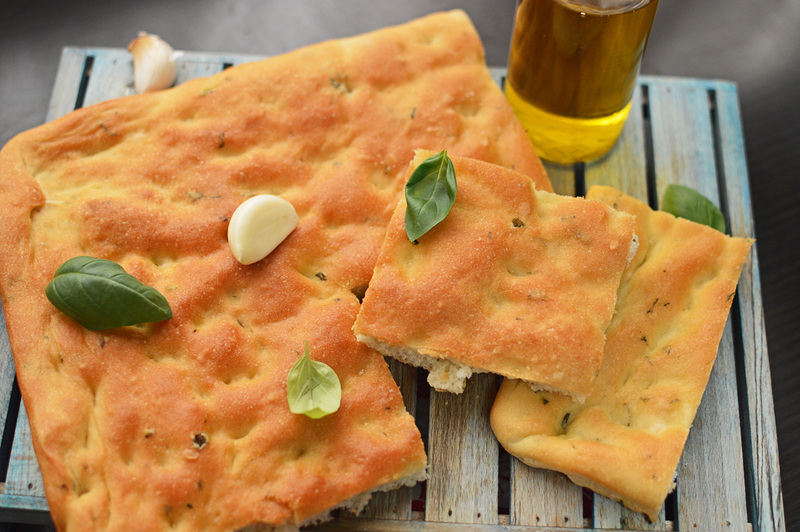 Wonderful as it is, I decided to up the ante by adding in hints of garlic and basil, seeing that harsh winters were not too kindly with my basil plant I decided to experiment with focaccia and the results were nothing short of magnificent. It was delightful and not too overwhelming. The best part however, was that it was easy to make. 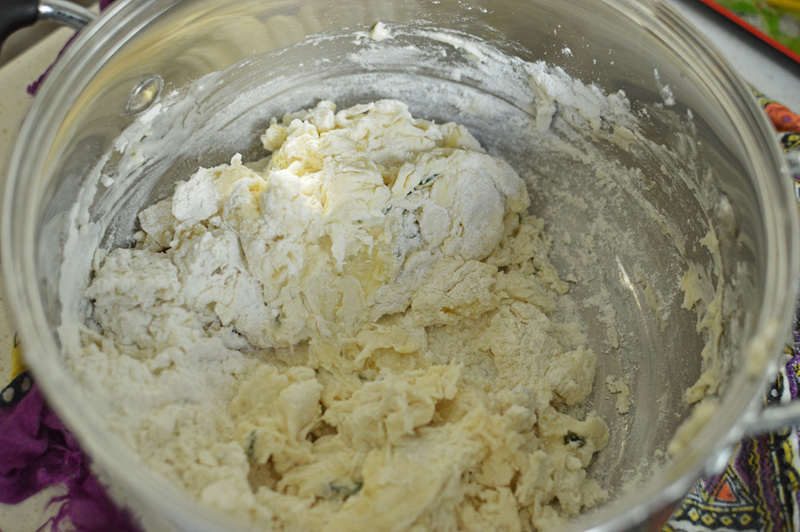 Flour, sugar, yeast, salt, olive oil, basil and garlic.. also water which I forgot to picture. Chop the garlic and basil not too fine. 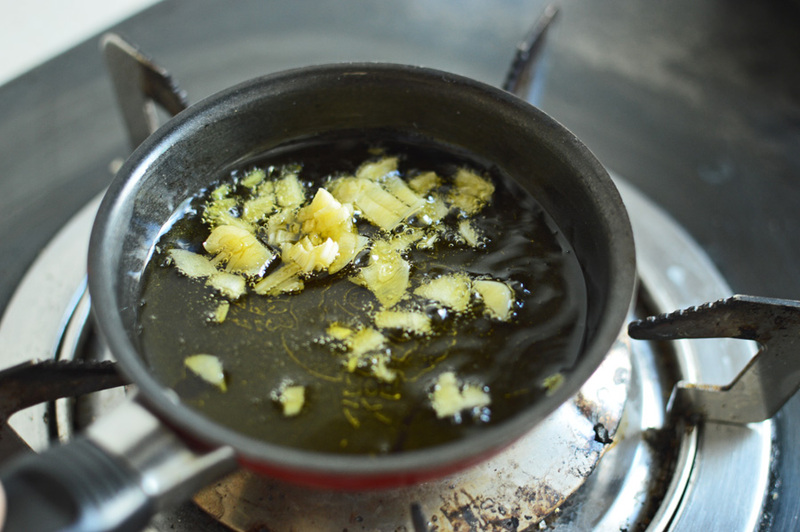 we begin with the garlic part of focaccia and I do this by making some garlic oil. I didn’t want to put bits of garlic in my bread as I want the garlic flavors, but not too pronounced. 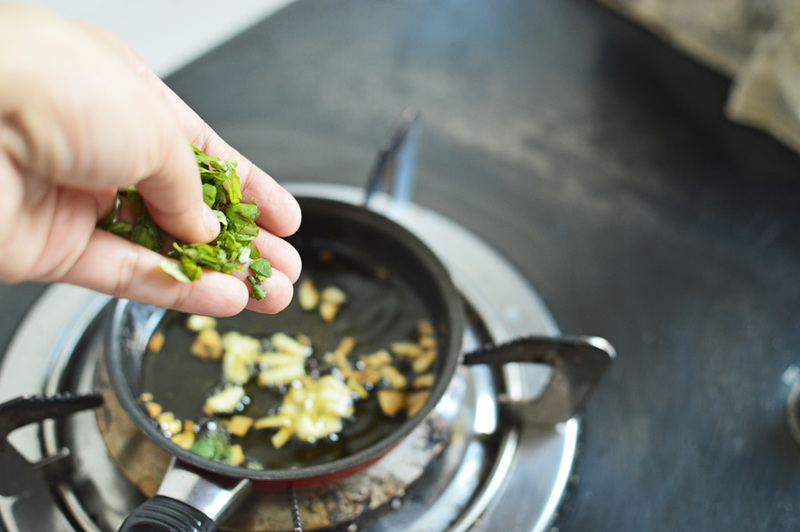 Heat some olive oil in a pan or vessel of choice. 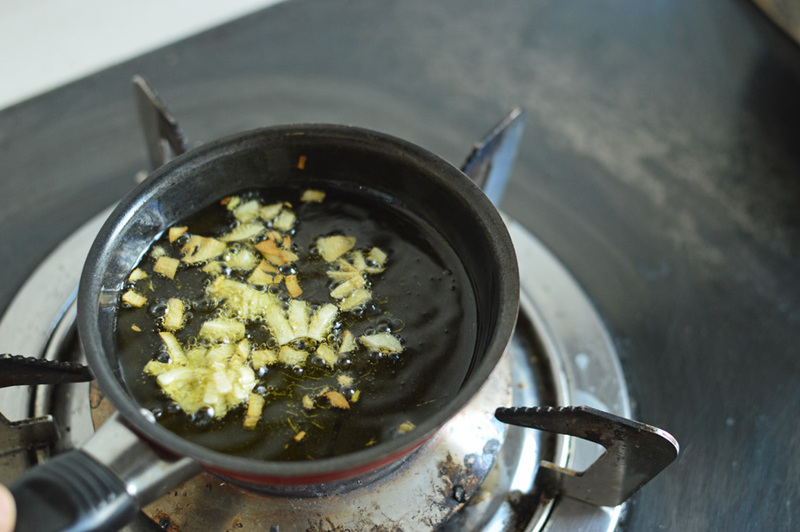 slowly as the oil heats the garlic will start oozing its flavours. and when it just starts turning brown you turn off the heat because they will keep getting darker in the hot oil. 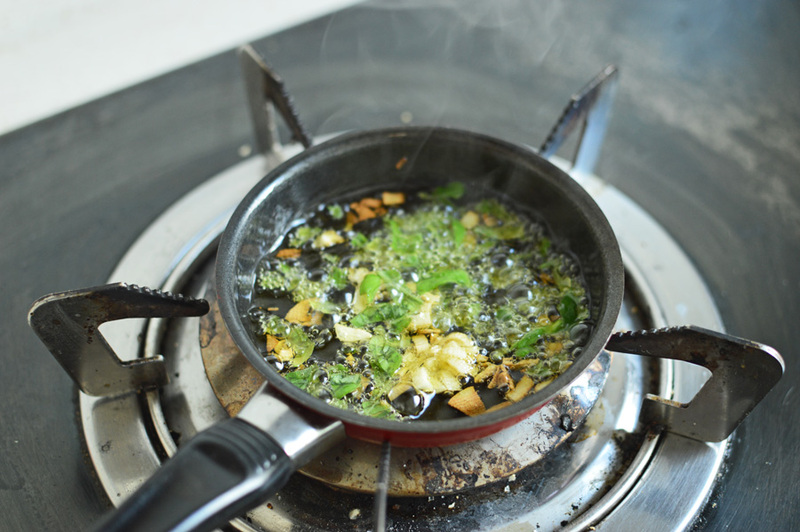 the basil will sizzle with the garlic and you’d wonder why this aroma has never been used for creating incense sticks. 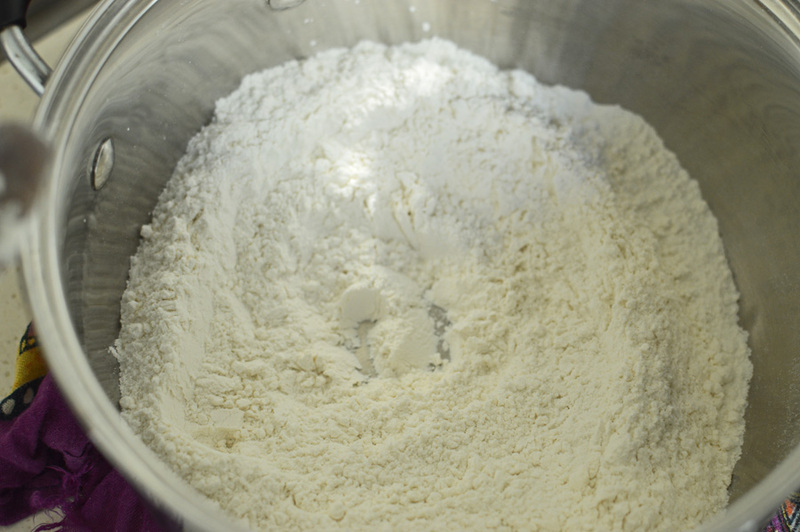 Leave it to cool and start with prepping flour for the bread. 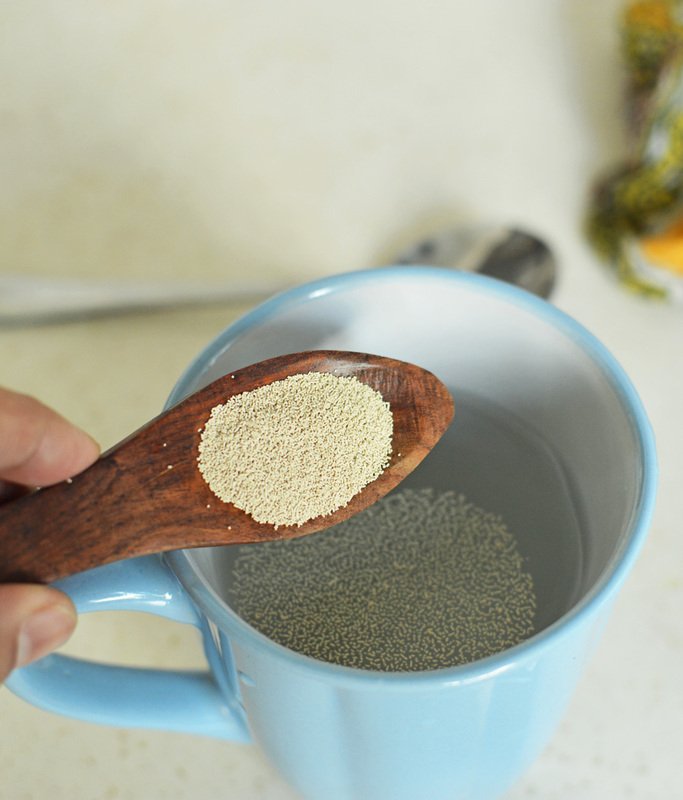 followed by sprinkling of yeast. leave it to proof for about 10 minutes and enjoy the proofing show from afar without disturbing it please. 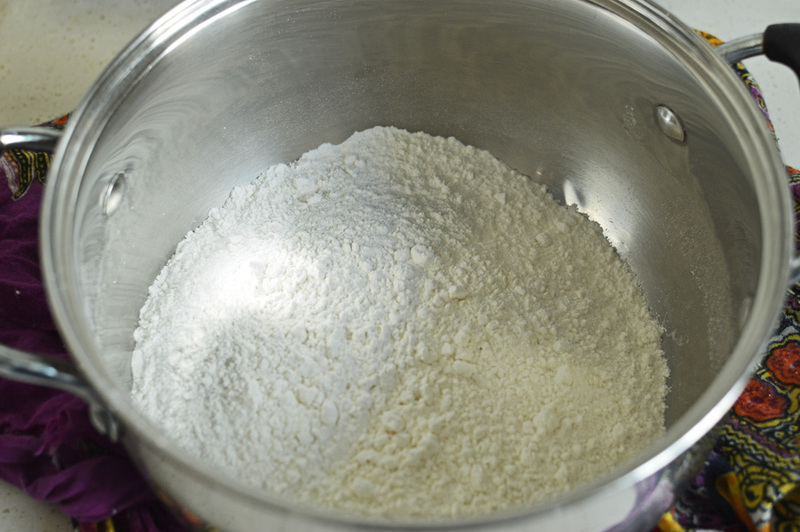 Use a big bowl or vessel of choice for the initial mixing of the flour. here is the flour in question. and mix and create a crater of sorts in the middle. This is where our liquid items will go i.e the yeasty water and the oil, and speaking of the oil.. aha!! it has cooled down and now we just have a small task at hand.. we need to get rid of these bits of garlic. 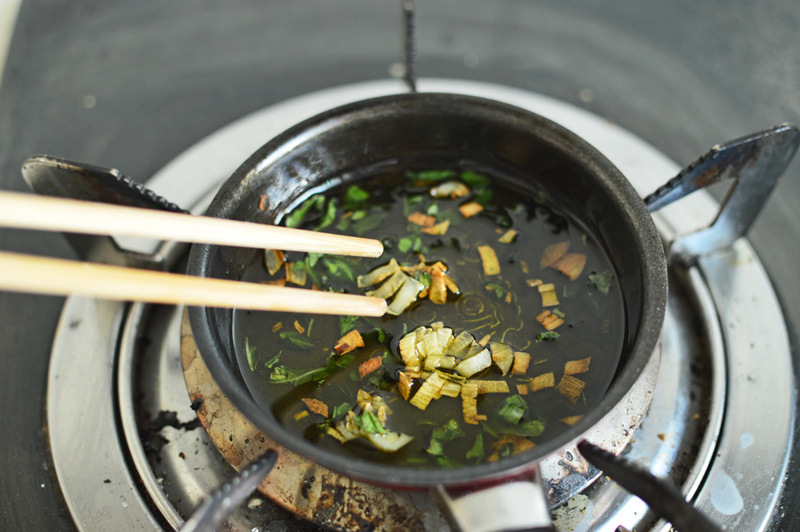 I use chopsticks, but please feel free to use fingers, spoon, fork.. it’s your oil. chopsticks are efficient. 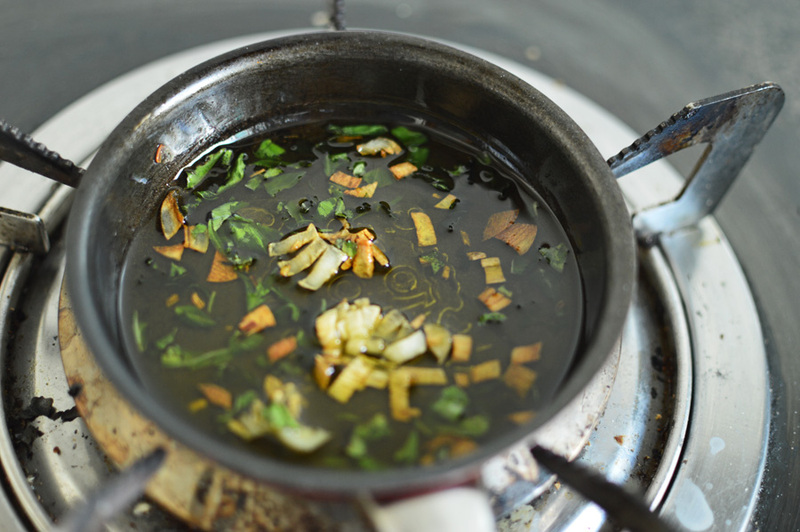 this is in essence very good aromatic and strong-smelling garlic oil with a hint of basil. here is where I realized I need MORE BASIL!! 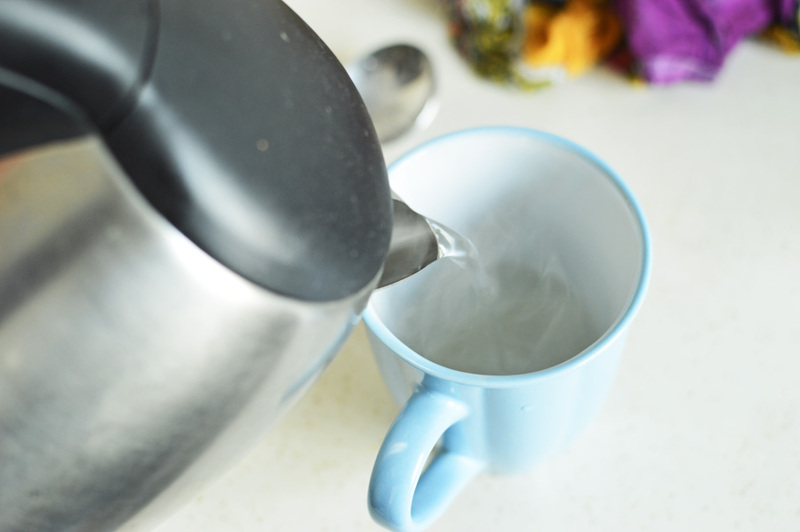 Back our yeasty water. 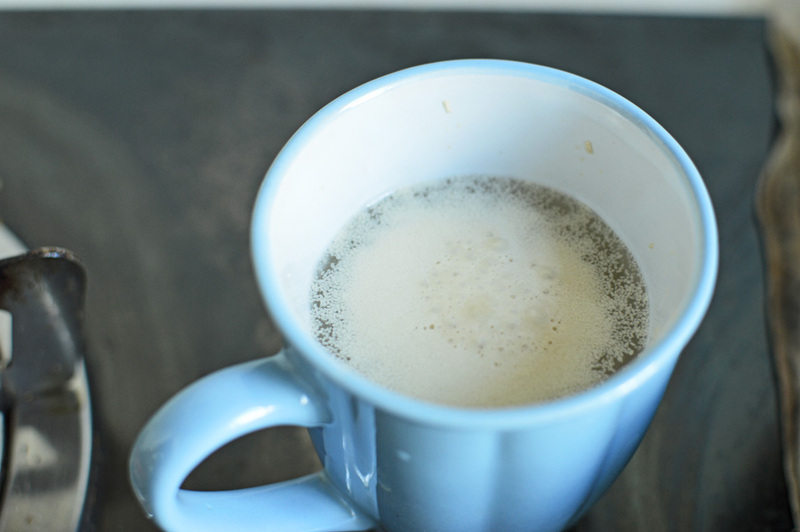 see how well it has foamed. mix with yer hands until it all just comes together. 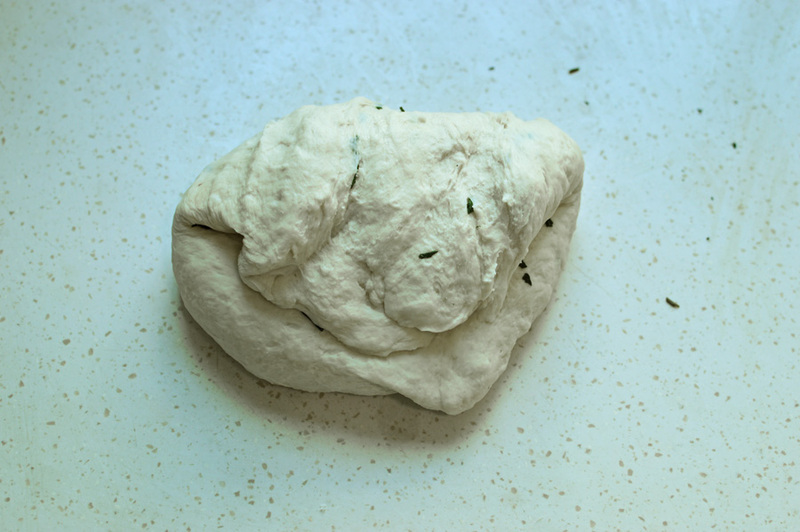 you need space for kneading.. so dump it on a very very clean surface and start kneading. 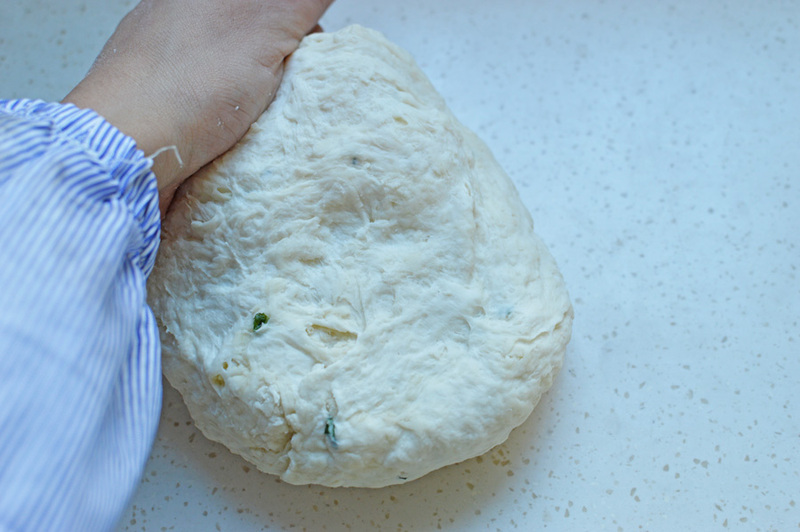 I knead by pushing the dough forward and pulling it back. This is where I thought would be a good time to add some more basil. 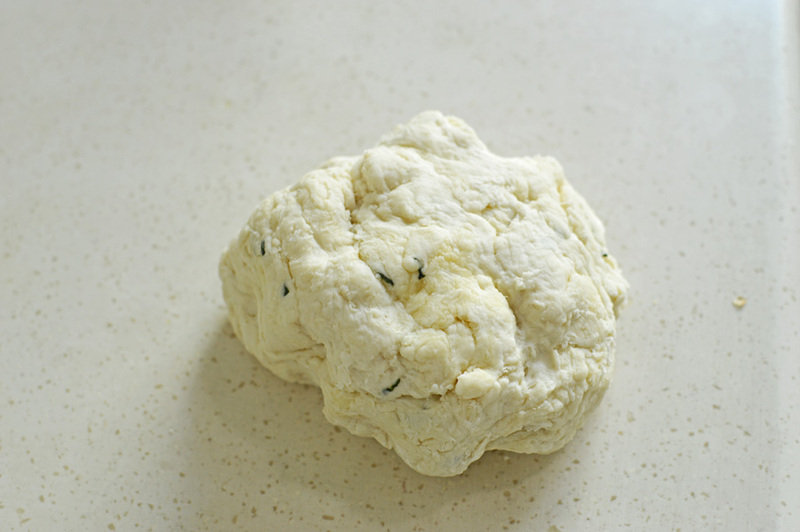 Basil meet dough. 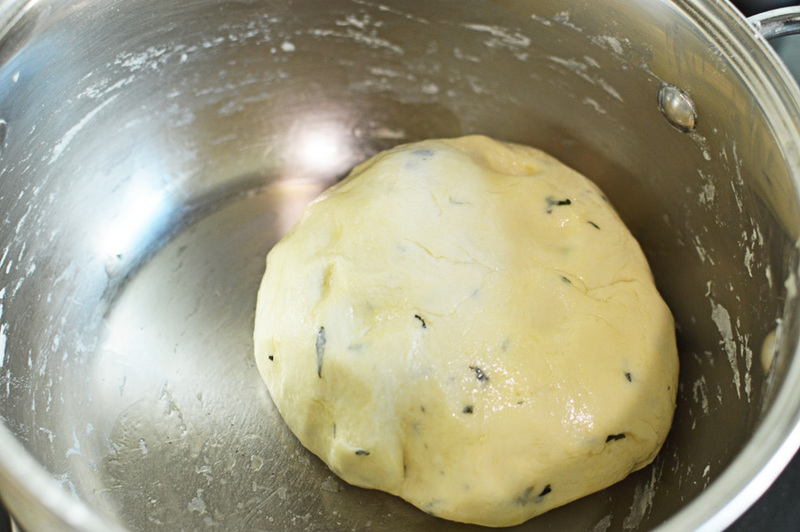 Dough meet basil. 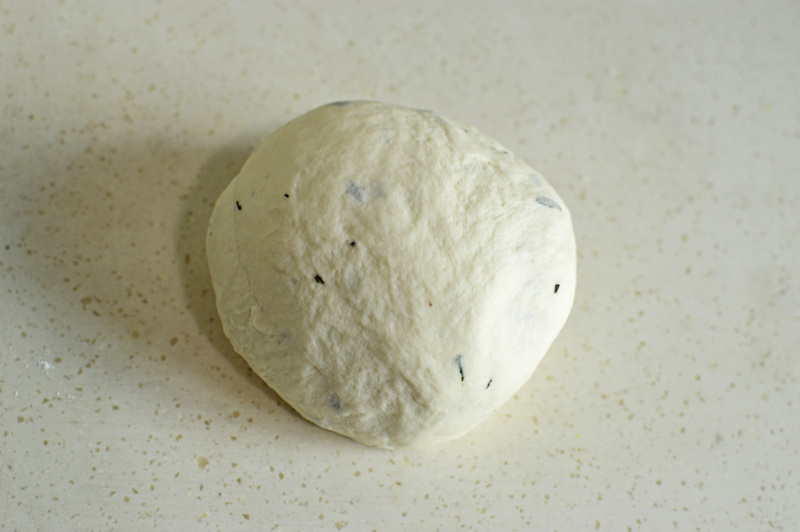 keep kneading to form a smooth ball. 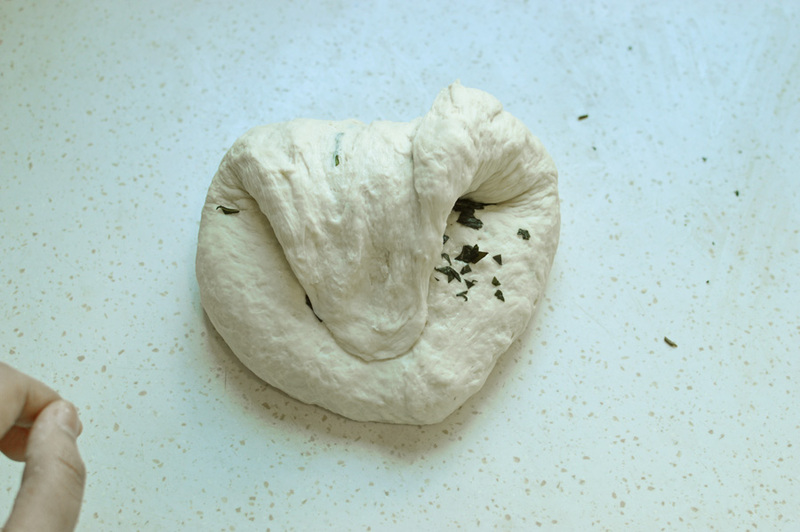 I worked on this dough for about 10 minutes. It gives you serious muscles but if you’re not a fan of working out then by all means use your muggle gadgets. 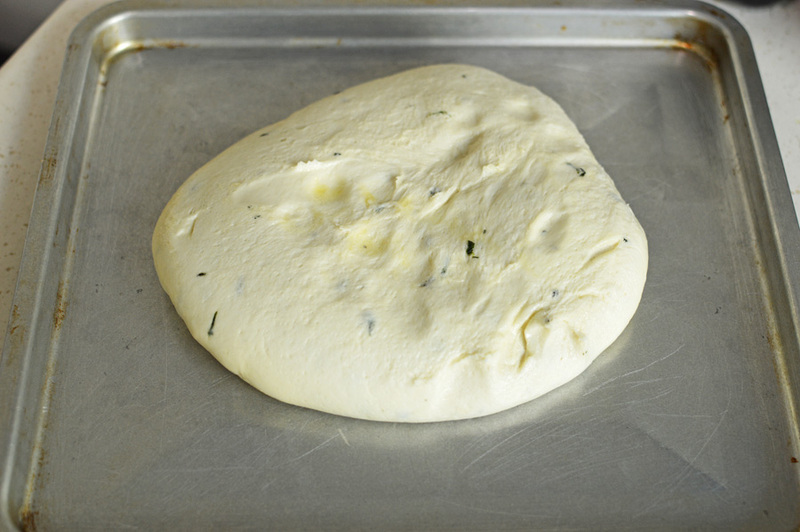 Now this dough, like any other yeast dough needs to rest. 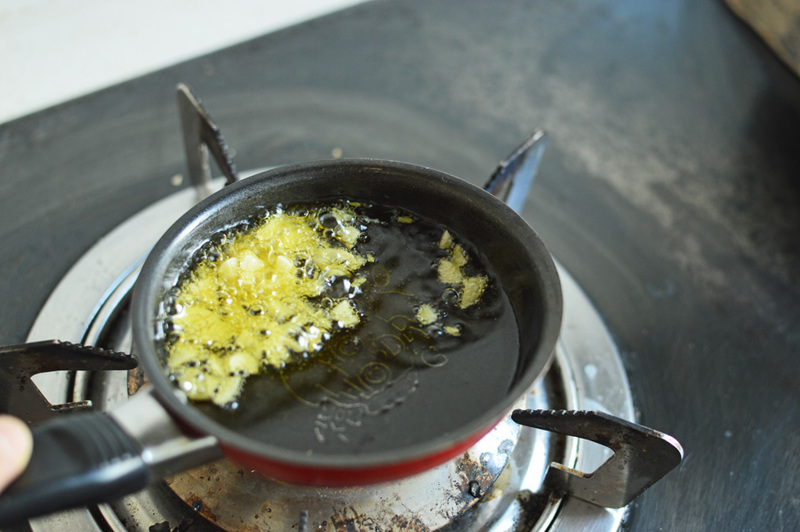 I used the same bowl from the initial mixing and poured in some oil, because we do not want our lover to stick do we? 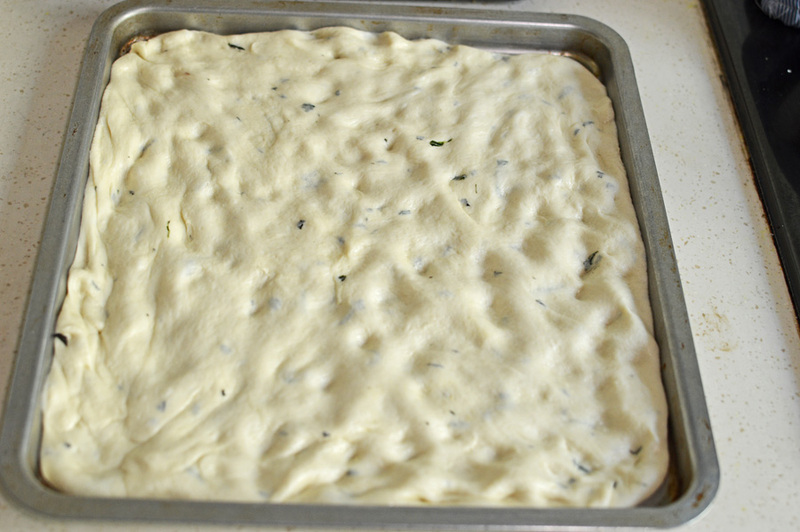 coat the entire dough with the oil and you can see that it’s a beautiful soft dough. 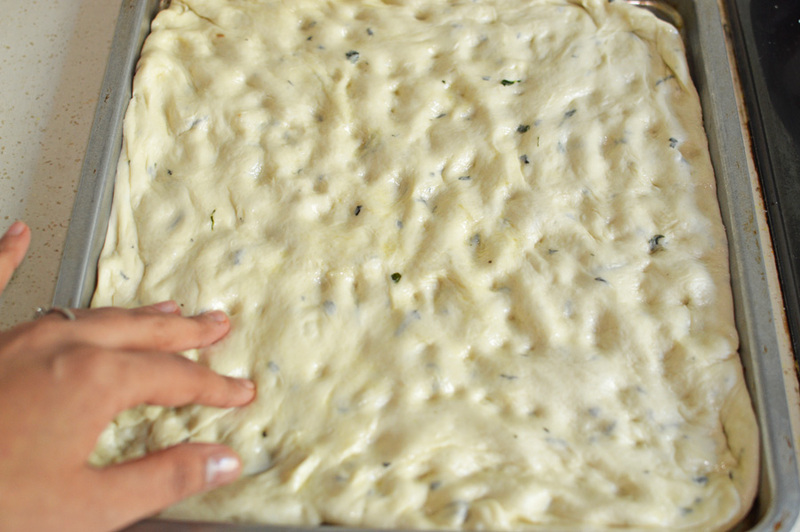 Cover and let rest for at least 1-2 hours or until the dough has doubled in size. If your house isn’t warm enough it might take longer but don’t fret.. it will get fatter. there!! so big, so beautiful. Flecked so daintily with basil.. sigh!! 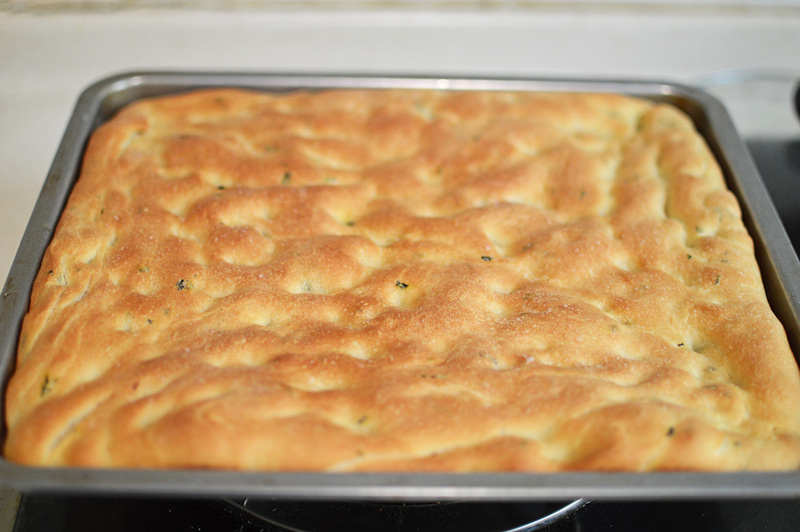 Now retrieve a pan or tin from the abyss of your pantry which you’d want the focaccia to bake in. Oil generously! 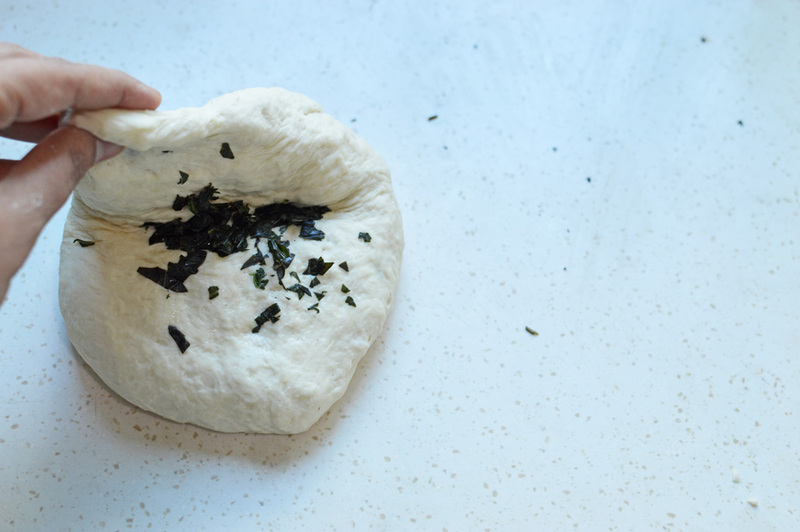 Pull your risen dough out of its hibernating vessel. You don’t need to deflate or anything, because we will soon be puncturing its smooth exterior with much-needed dimples. Plop it on the oil. and using your fingers, spread it to fit into the pan. 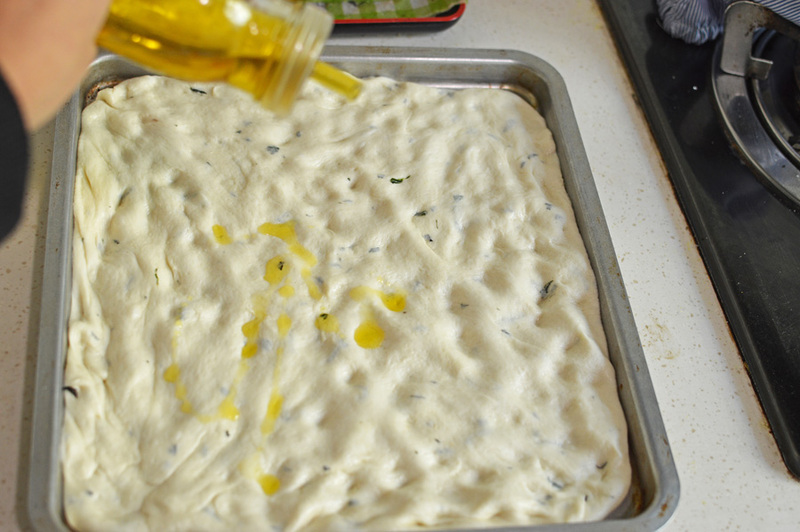 Now we oil it more, because it’s focaccia and it needs the good stuff. 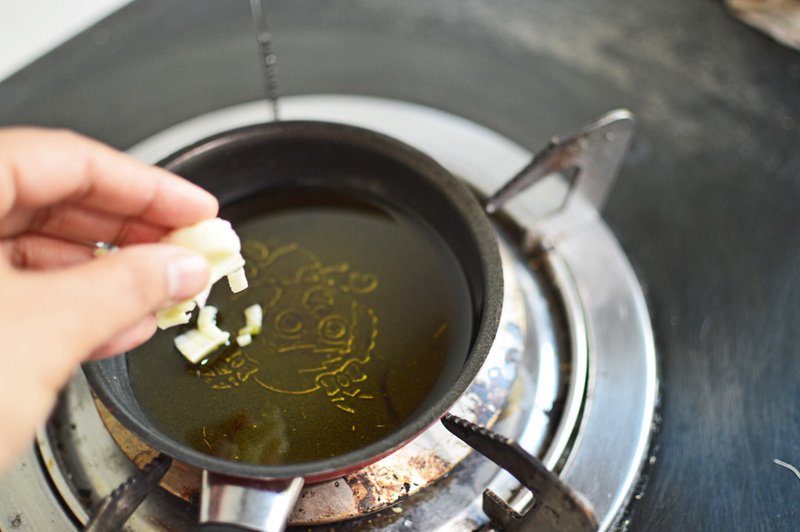 be sure to use good olive oil all the way. 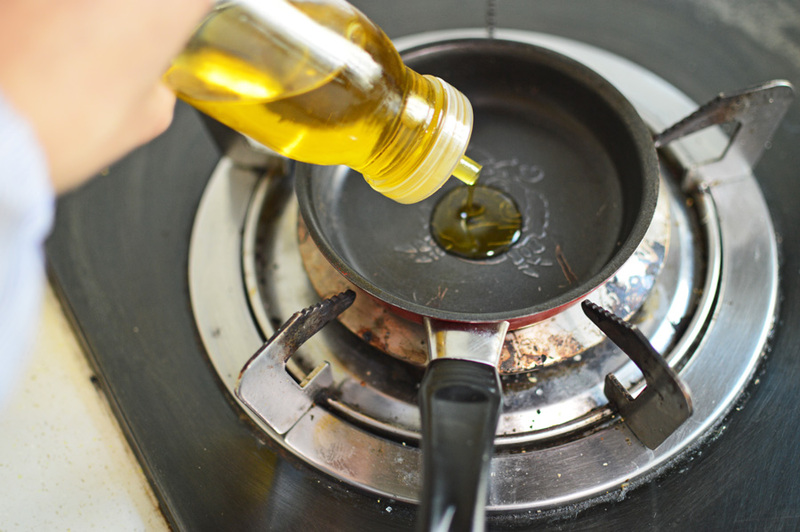 Massage in the oil gently. 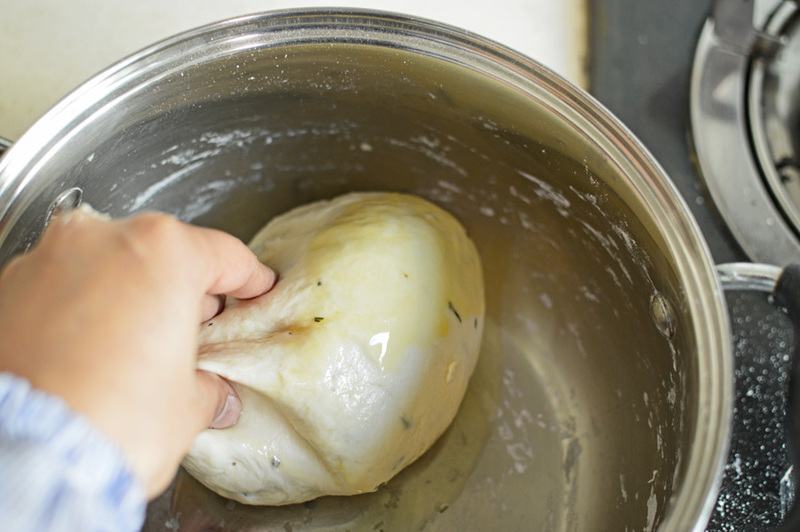 Cover well with a cling film and let rest again for another 45 minutes or until the dough has visibly risen and puffed up. It needs some more olive oil. Don’t be shy and spread on. 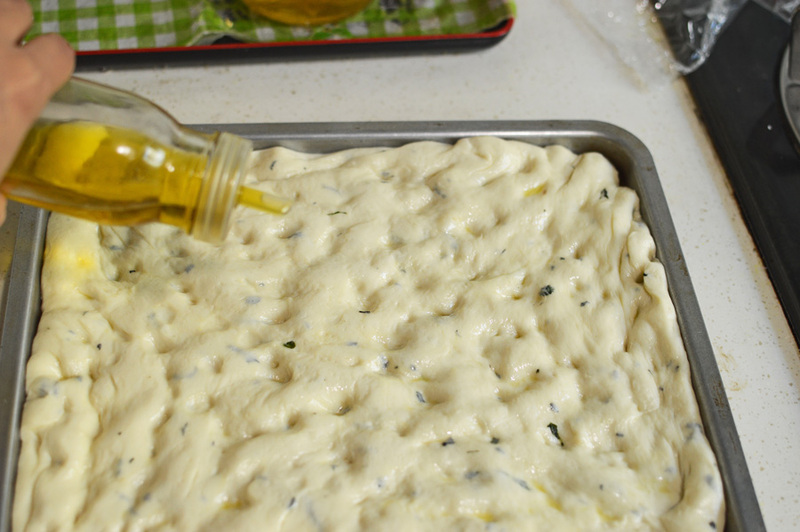 Don’t forget this is focaccia not some virtuous salad, so spread on the oil and do not feel ashamed. like so. Make sure all it’s pretty dimples have some amount of oil pooling in it. 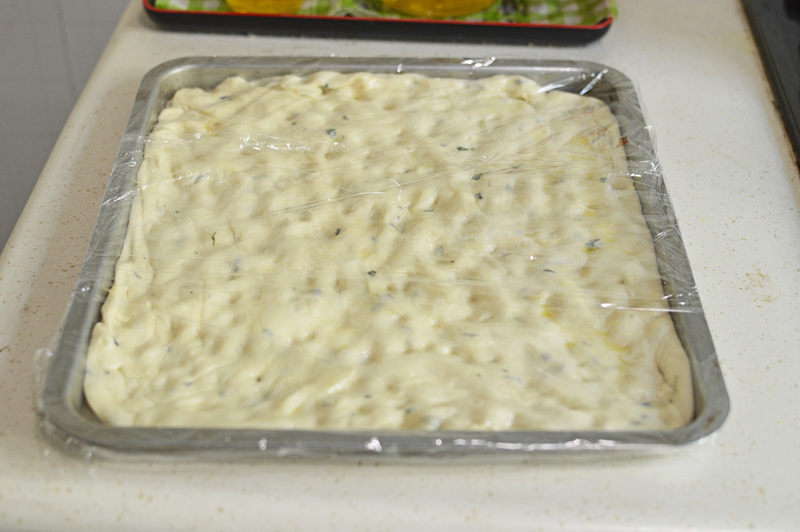 scatter some sea salt on top and now it’s ready for the oven. Time for celebration!! 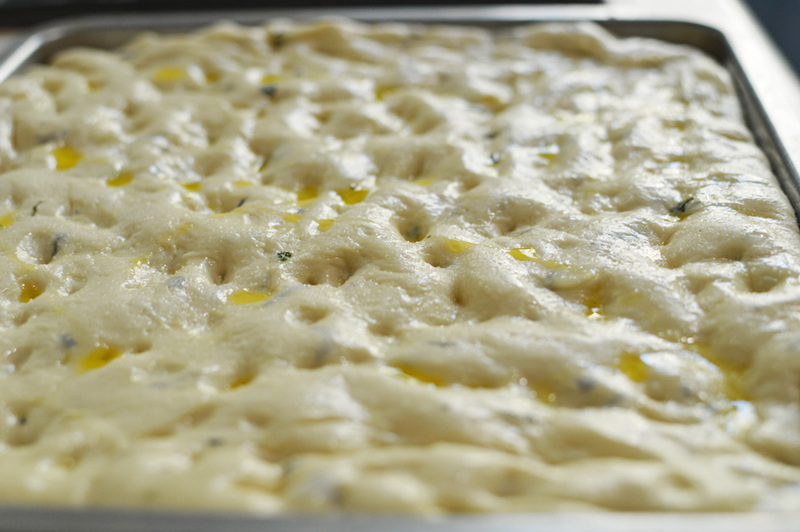 a jubilant slab of exquisite focaccia to be feasted on. devour with your eyes for now and let cool a bit. 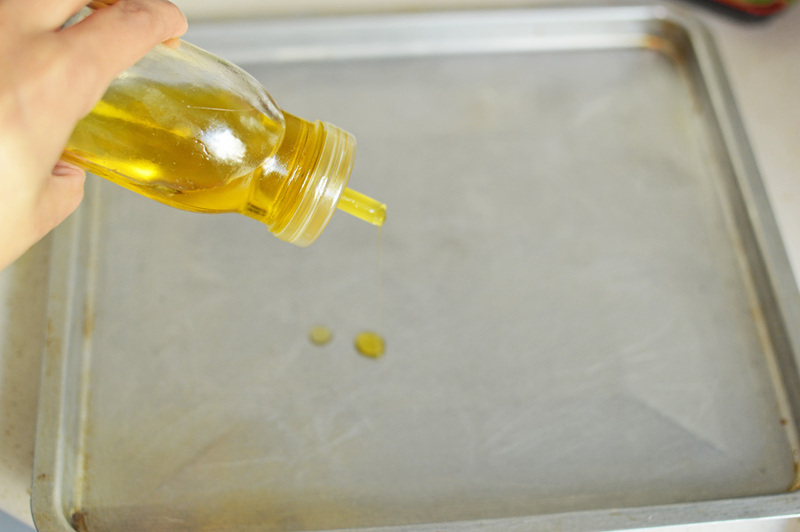 while it cooled I brushed some more olive oil because why not? There you go!! Dip in some more olive oil and enjoy!!! The garlic and basil flavors were not overwhelming but very mild and subtle. 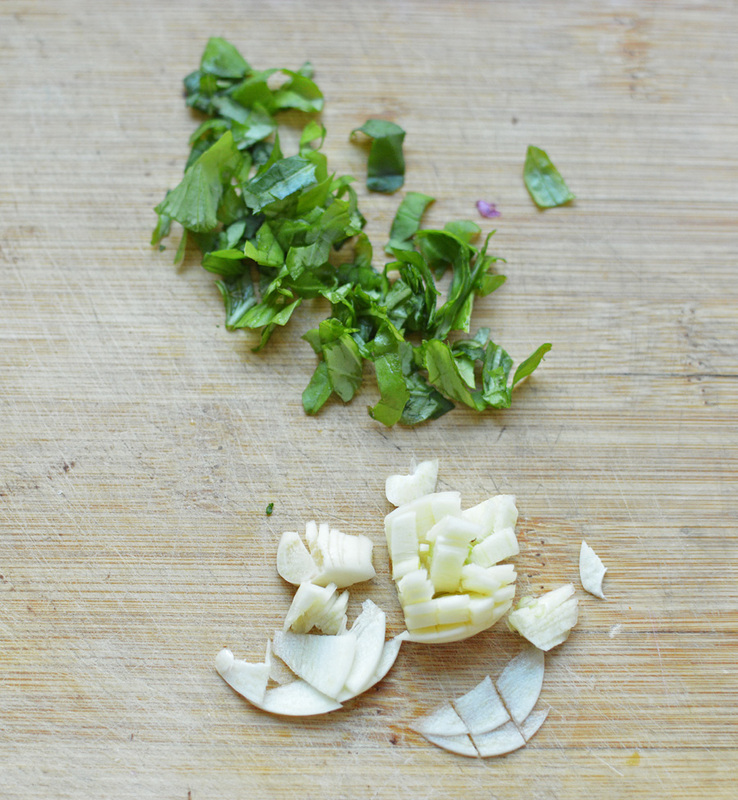 If you want bigger flavors, by all means increase the garlic and basil amounts. 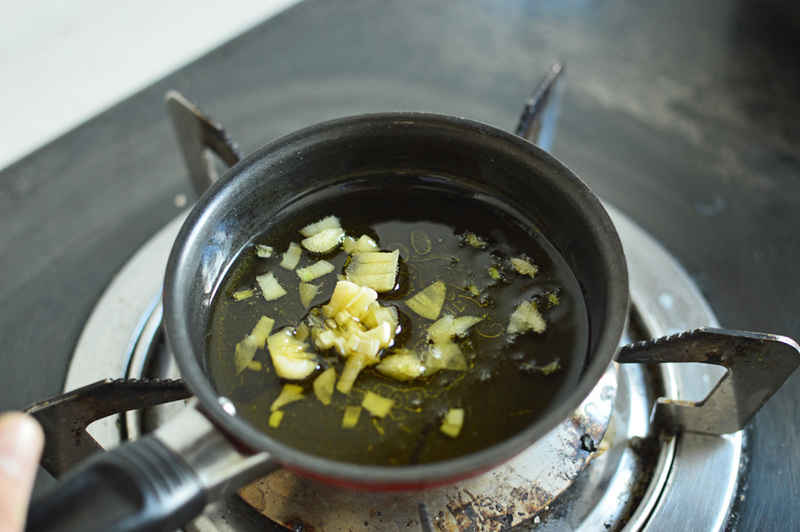 Heat the olive oil in a pan and add the chopped garlic until it starts turning brown. 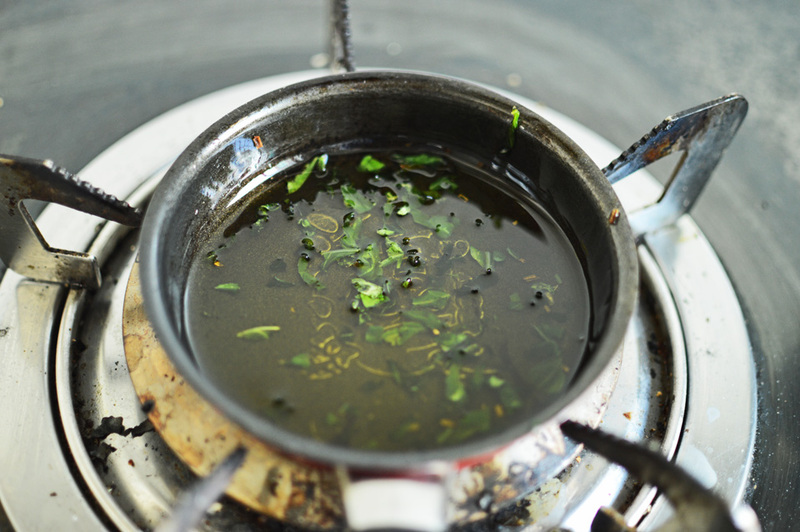 Turn off the heat under the oil and add the chopped basil. Let cool. 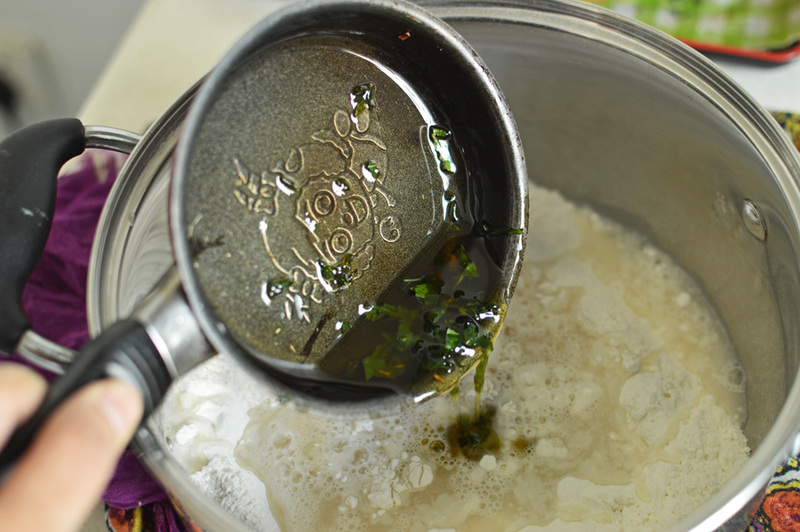 Once cooled discard the garlic and retain the basil. 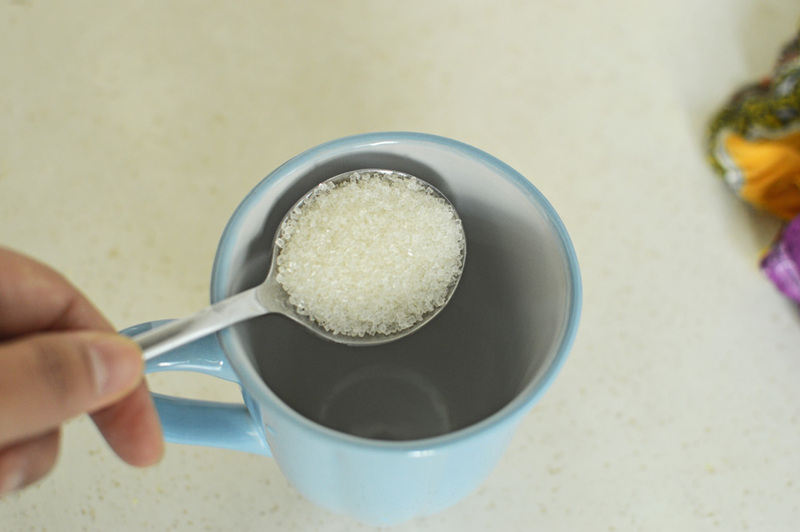 Mix the sugar and warm water and add the yeast. Let it start foaming on top. It takes about 5-10 minutes. 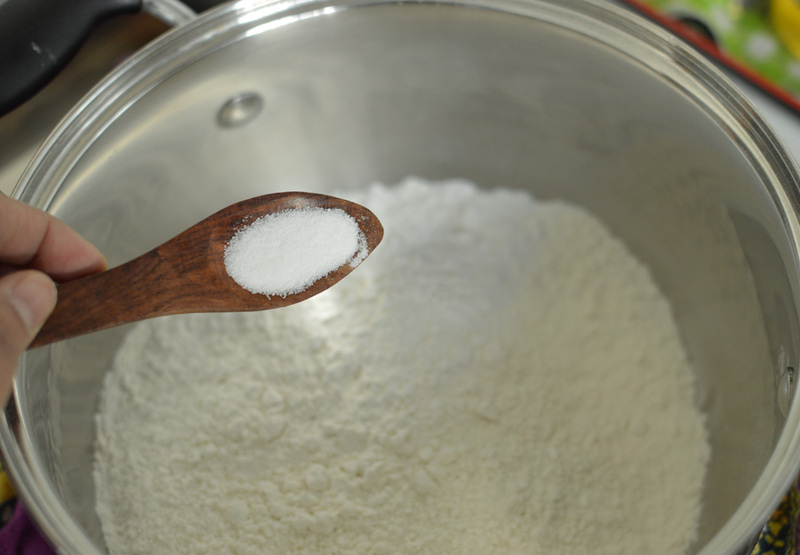 In a separate bowl add the flour and salt. 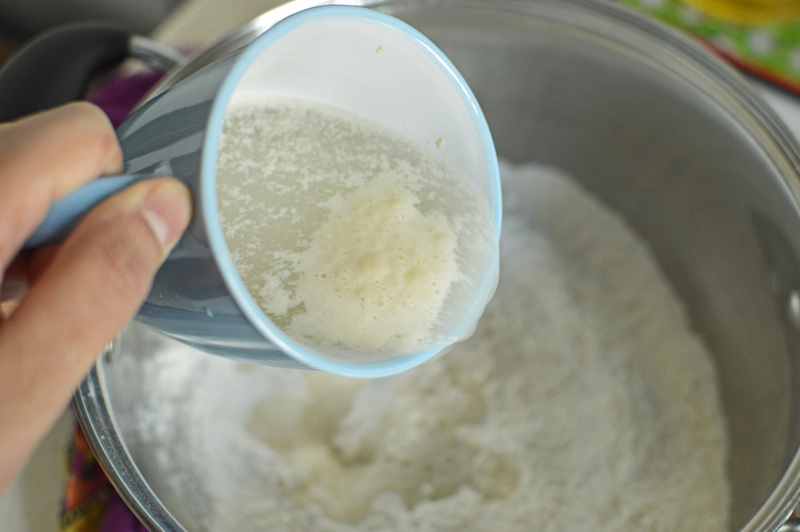 Make a well in the center and add the yeast water and oil. 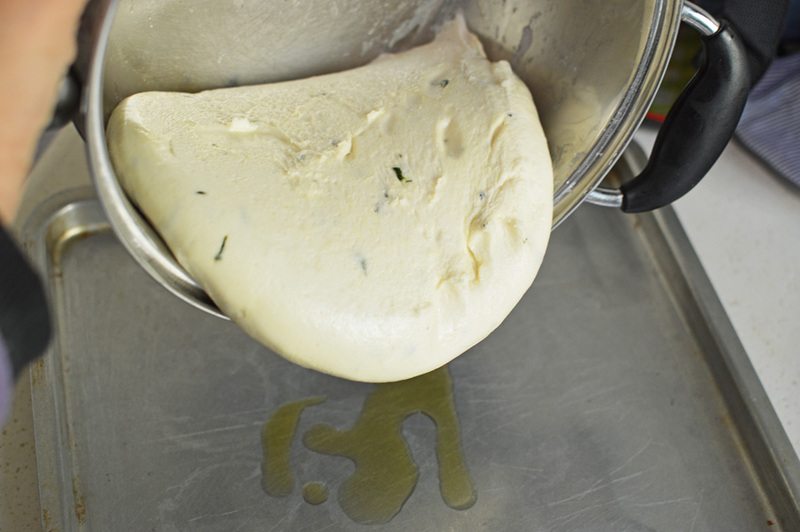 Mix until it starts clumping together and knead to form a smooth dough. In case the dough is too dry add some more water a little at a time. 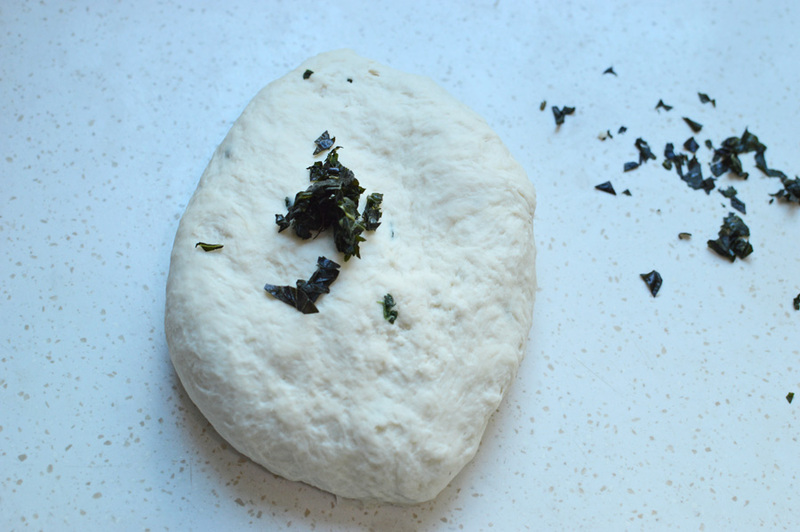 Knead for at least 10 minutes until the dough is very smooth and slightly springy to the touch. 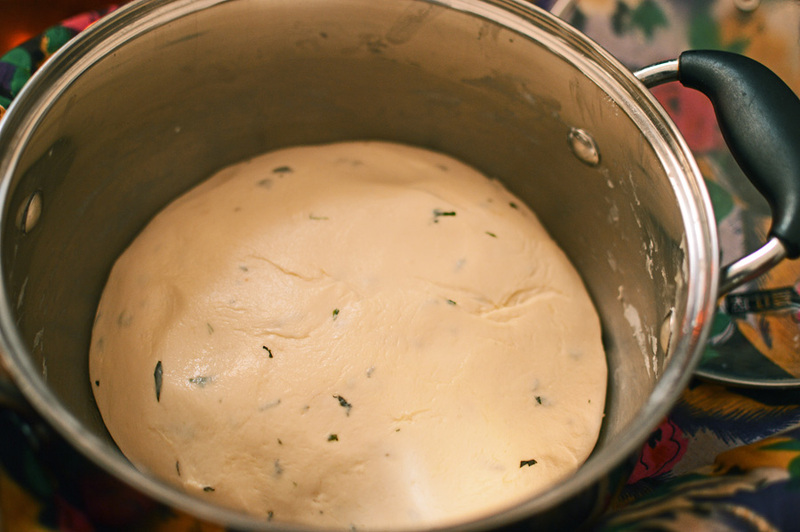 Let the dough rest in a well oiled bowl for at least 1-2 hrs or until it has doubled in size. 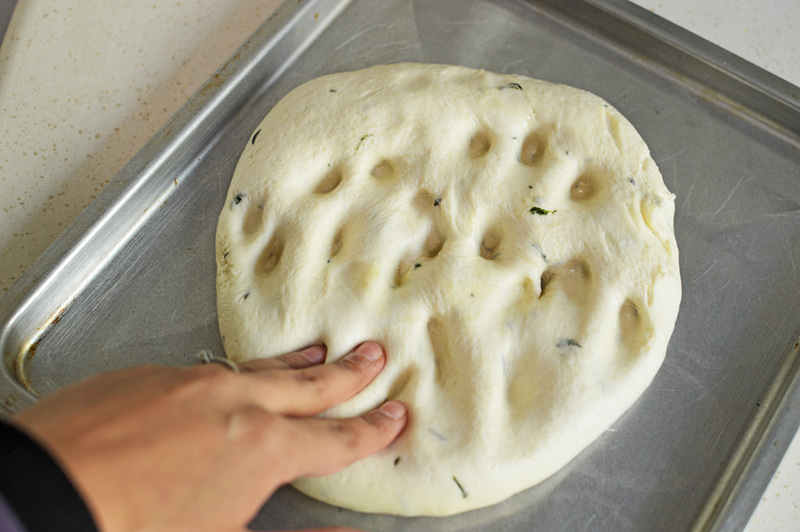 Once the dough has risen, tip it out on a well oiled baking sheet of your choice and spread using your fingers to give it the characteristic focaccia dimples. 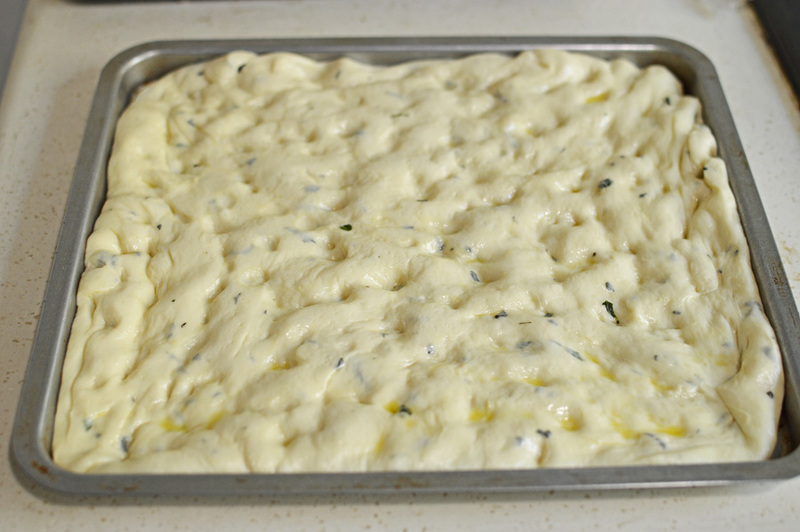 Once it’s risen pour some more oil ( about 3-4 tablespoons) on top and let it pool in the focaccia dimples. Sprinkle some good sea salt on top or regular salt or none if you wish. 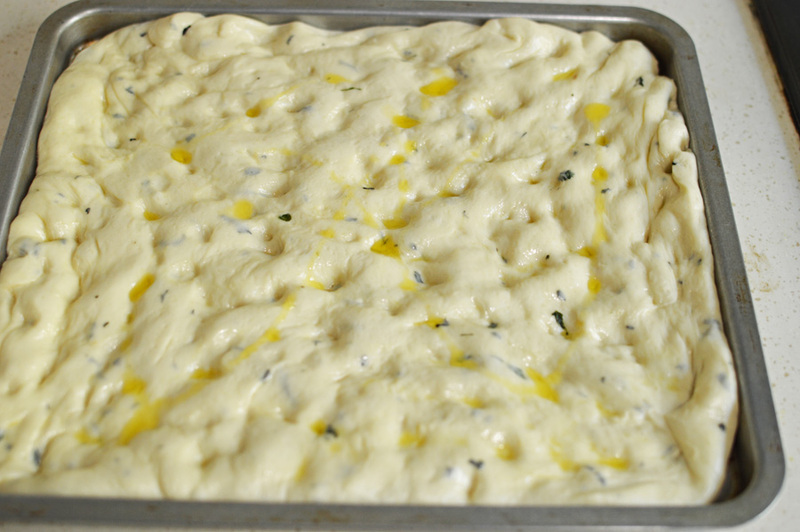 Bake at 190℃ for 25- 30 minutes or until the top has turned golden and the bread has risen gorgeously. 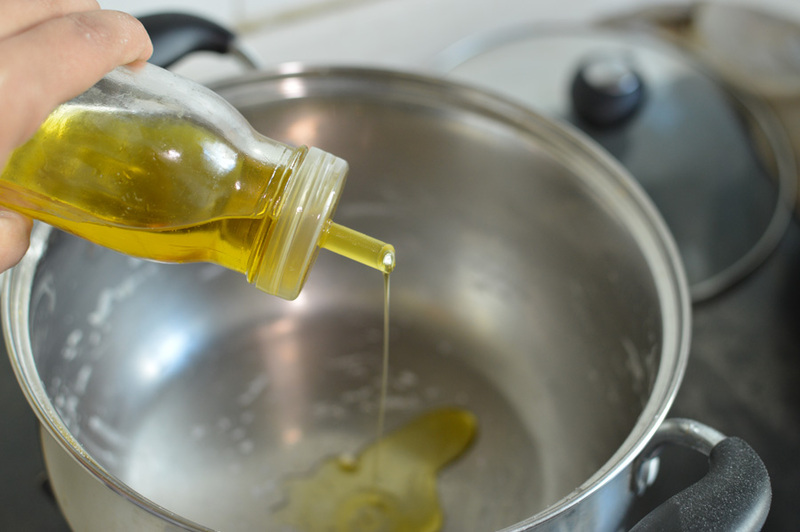 Let cool for a bit and brush again with some olive oil. Serve with hummus (see recipe here) or just plain olive oil. 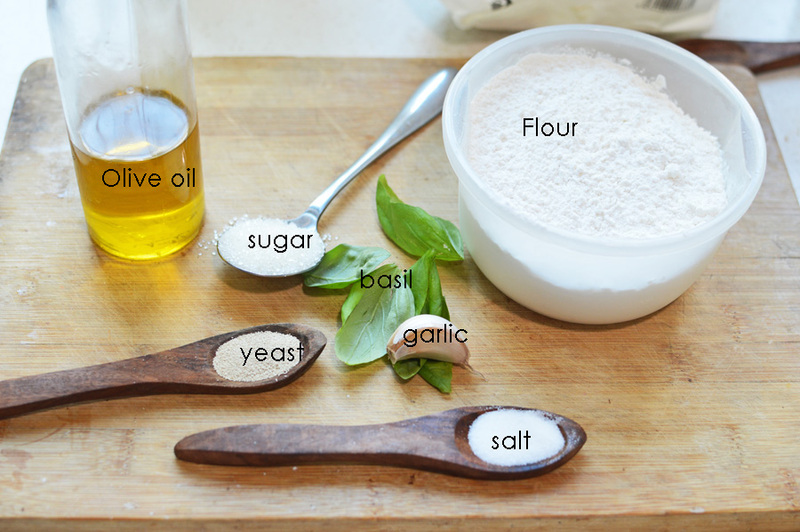 Posted on December 17, 2013 December 18, 2013 by driedredchilliesPosted in Baked goodies, Baking with yeast, DIYTagged basil, bread, Dough, Flour, Focaccia, Garlic, olive oil.